It has long been accepted that cashless payments are the future; and that before long currency will be superfluous, an archaic notion rendered obsolete by ways of paying viewed as safer and more convenient. Since the century began cash usage has been on the decline as customers opted to pay for goods and services with plastic with greater frequency. Banks and other financial institutions anticipated the change in attitude in advance, and have been prepared for the switch to business conducted exclusively through electronic media for more than 20 years. Virtually any new bank account a customer opens today comes with a complimentary debit card – a provision that contributed greatly to the prevalence of digital payments over the last decade or so. The switch to world where business is conducted solely through machines gathered pace at the turn of the millennium, but since, the showed signs of slowing, and last year reversed as more than half of all purchases in the UK were made by cash – a development that ended 10 years of gains by plastic. 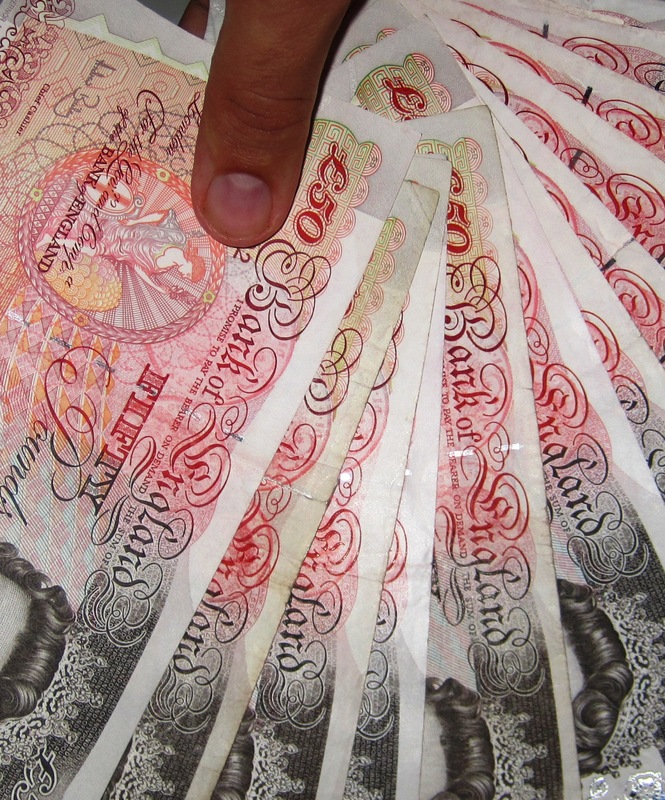 Last year, 54% of all transactions were conducted using cash, new research has revealed. Although the reasons why more consumers are choosing to pay by cash have not yet been studied, the organisation that compiled the figures, the Payments Council, speculates that it may be partly because paying with cash allows us to keep a closer eye on our spending, while reports in the media suggest that wide ranging mistrust of banks – in particular their ability to handle our funds – may also have contributed, as a staggering £6,139 was withdrawn from bank machines around the UK every second last year. The Payments Council, an independent organisation set up by the UK government in 2007 to monitor payment trends and consumer habits, says that the cash machine remains the most popular way for account holders to access their funds, and that last year the number of cash machines in the UK reached 66,000 – an all-time high. “Cash is still a vital part of our day-to-day lives, and more than half of all our payments are in cash, reflecting its easy use and wide acceptance,” commented David Hensley, Head of Cash at the Payments Council. More than 20.8 billion transactions were carried out with currency in the UK last year, compared to 20.6 billion the year before, the newly published research has found. The report comes shortly after a number of banks decided to reintroduce £5 to their cash machines – a move aimed at boosting the numbers of visitors to ATMs, and increasing the amount of money they withdraw. The idea was welcomed by customers across the board, and has led to calls from consumers outside the UK for similar steps to be taken in their countries. “The UK is one of the few European countries whose cash machine network is still growing. We are currently seeing an increase in cash withdrawals, but the challenge is to make sure the UK’s cash machine network still provides a service that customers want in 10 and 20 years’ time,” explained John Howells, chief executive at Link ATM Network, the company that accommodates virtually all of the transactions between bank and building societies in the UK and their customers. The resurgence of traditional cash payments comes despite new, more advanced payment technologies being rolled out by card makers and banks every year. Most recently, a new “wave” contactless payment system was touted as the next big thing, however its release has fallen largely on deaf ears as consumers remain wary of new developments to technologies that can put their funds at risk. Conducting transactions by smartphone, a payment method introduced by many US retailers eager to cash in on young, tech savvy consumers, is a practice which has been gaining momentum in across the pond, but even as Barclays and other UK banks roll out their equivalent, it’s far from a foregone conclusion that the trend will catch on here. Although the financial crisis, and perhaps more specifically the failure of Northern Rock — and the footage of customers queuing to rescue their money from the doomed bank — may have had an impact on consumers’ collective decision to move away from card dependency, events like last year’s Sony credit card fraud scandal, which left potentially millions of users’ personal and financial details exposed to online fraudsters, may also have made customers more wary of pulling out their card for every purchase. Even though their customers have made their trepidations about digital payments clear, it is likely that banks will push back with more electronic options, largely because cash is expensive too for them to handle, and a switch to an exclusively digital set up would save them on millions of pounds on costs like transport, security and storage, expenses which many financial institutions regard as a nuisance. Previous What should the Chinese Gov’t do about its Air Pollution? It has more to do with profit and control. The Banks own the card schemes in the UK and make money from the shop keepers every time someone makes a purchase on a card. And control? Data is one of the most profitable things to deal in – what we buy, what we watch on tv, … everyone wants that data. Good point. There is a lot to be said for the information card transactions can provide banks — or whoever might be interested in the information.